Greens. Mustard, Turnip or Collard. Just Greens, those Greens. That vegetable I despised growing up and was forced to eat. Against my will. Then, in my early 20's, my taste buds changed and I couldn't get enough of them! Now I can positively inhale them! 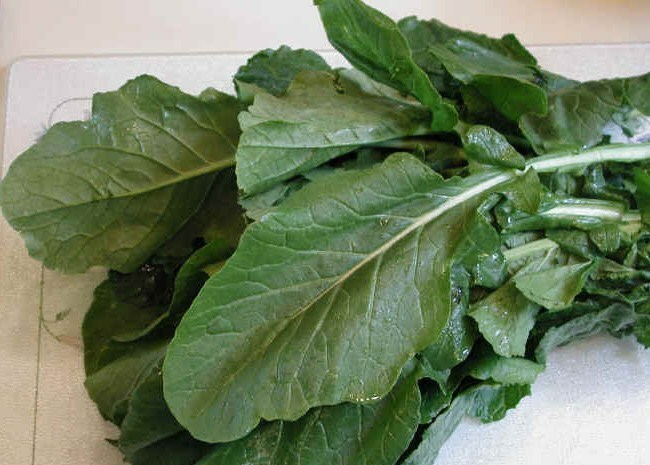 Greens are a winter vegetable and are only best after the first hard freeze. If you want to cook fresh greens out of the garden or from a farmer's market, that's when to do it. Otherwise, you can buy frozen greens. I find greens from the grocery store (at other times of the year) are on the bitter side and they shouldn't be bitter. 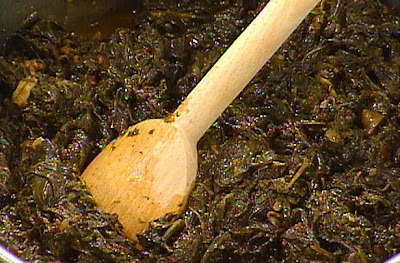 There are several ways to make greens and you can choose what's best for you. However, this is the "old" way of making them but you can modify the recipe to be more healthy. Sometimes I cook them the original way and other times I cook them "healthier". Also, fresh greens have a lot more volume when uncooked and will wilt down to practically nothing so you need to "eye-ball" your quantities when using fresh greens. If using fresh greens, strip the leafy parts off the hard stalks. Then soak and wash the leaves in soapy water 3 times to remove all the dirt, grit and debris. Each time, allow them to soak in the soapy water for about 10 minutes, swishing them around frequently to loosen and remove dirt/grit/debris. Repeat the process at least 3 times or until you are confident all dirt/grit/debris is gone. Rinse well. Fry salt meat/bacon in a large pot until brown. Add onion, celery and optional bellpepper and cook until wilted. Add your greens. If using fresh greens, add as much to the pot as possible. Cook the greens and as they wilt, stir to work the uncooked greens down to the bottom of the pot. Keep adding the fresh greens as you can. Add about 1-2 tbl oil, if necessary (this depends on the amount of greens you have). Once the greens are wilted enough to fit into the pot, add about 2 cups of hot water. You don't want a lot of water, so add the two cups, stir, cover and simmer a few minutes. You want just enough water to cook the greens and keep them moist, that's it. Then add the chicken bouillon. Stir well to dissolve the bouillon, season with salt and pepper and cover. Reduce heat to medium low and allow to simmer, stirring occasionally. Cook until greens are tender and dark, about an hour. Recheck seasonings, then serve.